A new show recently opened for those who want to remember and for those who just want to relive a time when songwriters created the melodies and lyrics that matched the mood of a nation at war. 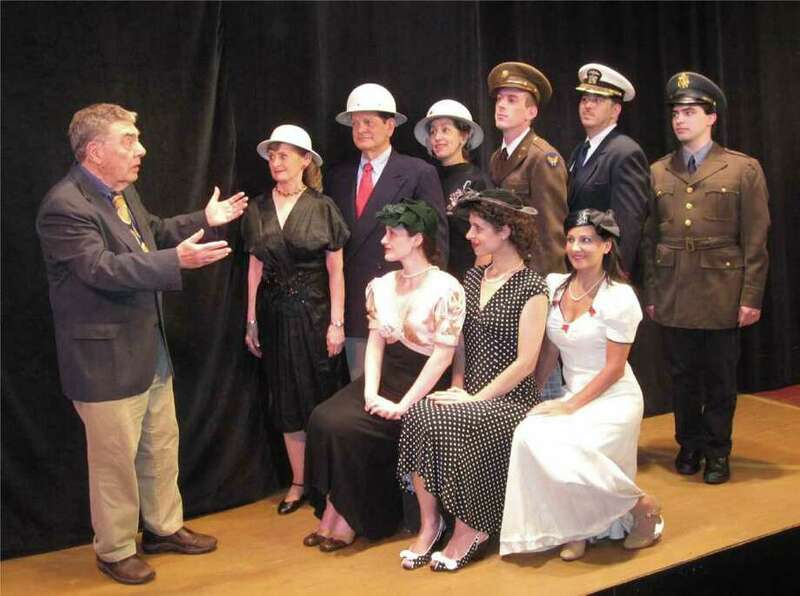 "American Songbook, the Music of World War II," conceived and directed by Stamford resident Richard Mancini, opened Friday, July 29, at New Canaan's Powerhouse Theatre. 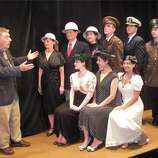 It is this year's summer show of the Town Players of New Canaan. The show flows from Mancini's interest in the era, particularly the music and popular culture associated with the American homefront. Not only did popular songs put to music the fears and longing of families worried about loved ones serving overseas, but many also served as patriotic rallying calls. The music (and other entertainment) also became a welcome export for U.S. armed forces serving around the world. Through organizations such as the USO, performers would travel to the frontlines to boost the morale of the troops. This original, musical revue, which runs through Aug. 13, will feature 48 songs from 65 composers and lyricists, including Cole Porter, Jerome Kern, Frank Loesser, Irving Berlin and Ira Gershwin. "The songs are a lot of fun to sing," Mancini noted. "Sometimes quaint and whimsical, several are topical -- so much of their time -- and hold up only in context." The selections are a mix of standards and lesser-known treasures, from "Boogie Woogie Bugle Boy," by Don Raye and Hughie Prince, to "Little Bo Peep Has Lost Her Jeep," by Frank de Vol and Jerry Browne. With so many songs to choose from, Mancini, along with the show's musical director and arranger Stan Wietrzychowski, have created a narrative -- from the war's beginning to its end -- through song. "There are relatively few lines of dialogue throughout the show," said Wietrzychowski, a Trumbull resident. Fortunately, the music of that era was rich with lyrics that told stories. They are the kind of songs Lester Colodny listened to as a young man in the 1940s. On the playlist "You'll Never Know," by Harry Warren and Mack Gordon, "First Class Private Mary Brown," by Frank Loesser, "Ev'ry Time We Say Goodbye," by Cole Porter, "Obey Your Air Raid Warden," by Les Burness and John Burrows, and "I'll Be With You in Apple Blossom Time," by Neville Fleeson and Albert von Tilzer. At 86, he said he thinks he may be the only member of the cast who was actually in World War II. He served nearly four years in the U.S. Navy. The songs "are really bringing back memories," said Colodny, who recently moved to Fairfield after many years of living in Westport. He will be performing the classic, "I'll Be Seeing You," by Sammy Fain and Irving Kahal. "I am mostly a director and actor, but this (show) really appealed to me," Colodny said. He has long been a singer, beginning when he was a teen in Brooklyn and was selected to the New York All City High School Chorus. As to this musical era's ability to reach so many successive generations, Colodny said he suspects that it is the simplicity of the lyrics and the beauty of the melodies. The songs "will linger long after the current jumble of rap and rock and roll will disappear," he noted in an email. "I believe if the younger generation takes the time to listen to them, they will realize what they have been missing." For 30-year-old Lauren Nicole Sherwood of Stamford, the appeal of these songs have never diminished, and likely never will, she said, considering they tap emotions and situations that are universal to the human experience. "The stories that they tell are still being told now," she said. "And, it is a very honest way they tell it. This music is something people can connect to. I think that is why it has sustained itself through the years." This is Sherwood's first show with the Town Players, though she has been performing for many years. For the past four years, Sherwood has worked in the theater departments of several schools, including Saxe Middle School in New Canaan and Rippowam Middle School in Stamford. She also has directed shows at her alma mater, Stamford High School. "The music is exciting, it is funny and it is poignant," Sherwood said. The Powerhouse Theatre is located at Waveny Park, 677 South Ave., New Canaan. Performances are Aug. 5 to 6, 12 to 13, 8 p.m.; July 31 and Aug. 7, 2:30 p.m. $25, adults; $20, students and seniors (age 62 and up). To make reservations, call 203-966-7371. Patrons are asked to bring nonperishable food items for the New Canaan Food Bank to the performances.